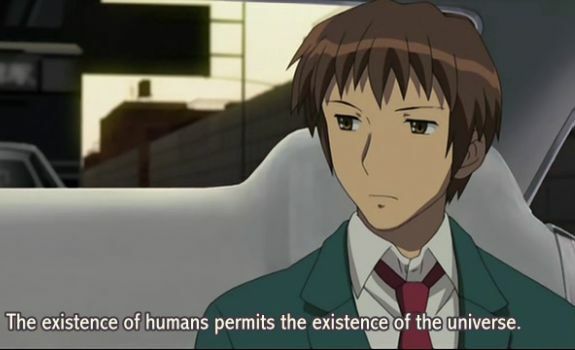 Even Japanese teenagers are somewhat familiar with the anthropic principle, it seems. You may be familiar with the â€œanthropic principleâ€, the notion that the universe seems to be suspiciously ideal for human life. If only one of the many cosmological constant had been a tiny bit different, intelligent life â€“ or even life at all â€“ would not have been possible. There are just so many things that must go right for us to be here. While this was not its original purpose, the anthropic principle has been cited as a reason for theism, the belief in one or more higher beings that created and/or guided the universe to this state of being. Alice: Bob, I experienced a genuine miracle! Bob: There are no miracles, just more and less likely events. Alice: Wait till you hear this. I was on a passenger flight yesterday, and suddenly our plane exploded more than a mile up in the air! I was thrown out as the plane broke in two, and plummeted toward my death. Then suddenly I crashed into an eagle, and it broke my fall a bit, but of course not enough. Just afterward, however, I hit another eagle, and another, and another. This continued all the way down until I landed safely on a bed of moss. It cannot be anything other than a miracle! Bob: Let me just ask you one thing. If you were dead, would you still be telling me this? Bob: See? Since you are here, it was not only likely, it was downright unavoidable! There is nothing mysterious about it at all. This entry was posted in philosophy, religion, science and tagged anthropic principle, cosmology by itlandm. Bookmark the permalink. This sound like the quantum immortality line of reasoning. While not using that phrase, I have mentioned long ago that if the branching many-worlds hypothesis is true, then the multiverse would likely be littered with dead Magnus Itlands. I suspect the same is true for most, possibly all, of us. But knowing this confers to me no sense of immortality, rather of the fragility of life – even though I see it entirely as a thought experiment. This holds true also on the cosmological level: I feel no certainty that there will always be an observer in the cosmos, or the multiverse for that matter. I do not see that logically follow in any way.